Ten years after losing his leg during the war, former FBI Hostage Rescue Team leader and U.S. war veteran Will Sawyer (Dwayne Johnson) has maintained a relatively safe family life. He now assesses security and safety measures for the world’s tallest buildings and skyscrapers. While on assignment in China, Sawyer and his family are invited to stay at the Pearl, a luxurious 240-floor skyscraper for which he's tasked to assess the safety. During a meeting with the owners to discuss his findings, he reveals that while the Pearl is a beautiful achievement in architecture, he doesn’t believe it is actually safe in the event of an actual dangerous situation. Back at the Pearl, a group of terrorists seize the building and set fire to the 96th floor, effectively trapping Sawyer’s wife (Neve Campbell) and their children above the fire line. Sawyer works to get inside the building so he can save them but is captured by the terrorists and instructed to help them recover something hidden in the building that they desire. In order to convince him to help them, they take his family hostage. 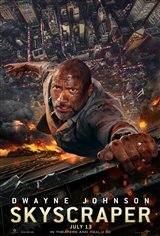 Now, Sawyer must figure out why all of this is happening and rescue his loved ones while navigating through a burning skyscraper.